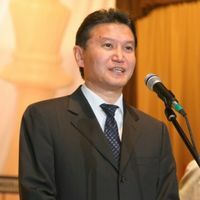 FIDE President Kirsan Ilyumzhinov: The situation reminds me of the one in the early 90s, where Kasparov and Karpov were involved and then, as you know the chess world became divided into two parallel organizations, with two champions. And now unfortunately, they start to split the chess world again. One of them wants to become President of Russia, and the other one – President of FIDE. But we live in democracy. It is a pity that they are splitting the RCF. FIDE has reacted to Karpov’s words about corruption in our organization. 20th April we had the Presidential Board of FIDE and our Ethics Commission led by R. Rivello invited Karpov to tell exactly where he sees corruption. But if there is no such a thing, he should apologise. In 15 years we have not had any single scandal. Then Karpov realized that he has not made a mistake. Our budget is transparent, and once a year we have an external audit, and our Treasurer makes a report. It is difficult for me to respond to Karpov’s statements, as he is out of reality, although he is a member of the Presidential Board and three years ago he officially was nominated a FIDE representative to the IOC. He is speaking about things which are not taking place. Such crisis in the RCF cannot influence FIDE. Will you be against if Karpov runs for FIDE Presidency not from Russia, but from other countries? No, I will not. We have democracy. Let him run from France, Japan, Zimbabwe or any other country.